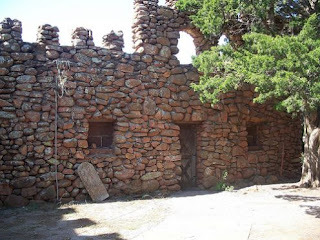 Located in the rugged terrain of the Wichita Mountains Wildlife Refuge, The Holy City of the Wichitas is a recreation of the very streets that Jesus Christ walked. While it may not be the true holy site in Jerusalem, Oklahoma's Holy City still draws thousands of visitors a year. This Holy City would not have existed but for the inspiration and foresight of Reverend Anthony Mark Wallock. He fell in love with the grandeur of the wildlife refuge during his first visit. Shortly after, in 1926, Wallock took his Sunday school class up a mountain in the Wichitas and presented a recreation of the Resurrection. That short, early morning service was the birth of the annual Easter pageant, The Prince of Peace. The success of the service quickly grew, attracting six thousand spectators by 1930. By 1931, the congregation swelled to 15,000, including 150 cast members. By 1934, over 40,000 worshipers came. This popularity helped Reverend Wallock get a grant of $94,000 from federal funds specifically to construct a full-scale replica of the Holy City in Oklahoma. The first set of buildings were completed by the Federal Works Progress Administration (WPA) and included Calvary's Mount, the Temple Court, Pilate's Judgment Hall, Watch Towers, The Garden of Gethsemane, dressing rooms, and rock shrines, as well as the walls and gateway to Jerusalem.